The First Data FD200Ti features a built-in check reader and imager that processes checks through the TeleCheck Electronic Check Acceptance® (ECA) service, which verifies the customer’s checking history and, as an option, offers a warranty service. In addition to substantially lowering the merchant’s risk, customers’personal information is protected, too, because the checks are returned to them after scanning. For the busy merchant, this also eliminates the need for time-consuming trips to the bank to deposit paper checks.While the check reader/imager processes paper checks, the device’s magnetic strip reader accepts all major credit and debit cards. Connectivity is via Internet protocol, dial-up or (optionally) Wi-Fi. 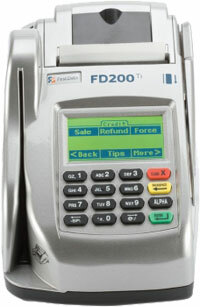 As an option, the FD200Ti also offers Dynamic Currency conversion (DCC) service, which makes it possible for international customers to pay in their credit card currency.